The 13 Ghosts of Scooby Doo is the best Scooby Doo cartoon series! Thread: The 13 Ghosts of Scooby Doo is the best Scooby Doo cartoon series! *How are they going to explain where Fred and Velma were during the 13 Ghosts? *Looks like they might be keeping Daphne's action girl portrayal from a few other versions. *Seems odd to include the bit about the gang having retired. *Why do I get the feeling Flim Flam will be revealed as being evil in this? How many seasons / episodes does this have? I'm a assuming not many, given all the scooby revamps. 13 ghosts was 13 episodes and one season however it was the third season of a series of shows where daphne was leader and fred became a mystery writer and velma worked for nasa! Daphne got a huge change and was made more of a leader role. She also knew a little karate where that joke in the live movie came from. Some say this is the best version of her. Fred and velma show up in some episodes when they get off work. The three shows were new scooby and scrappy, new scooby mysteries and 13 ghosts of scooby-doo. The show got stale with the fake ghosts and was going to get canned. They even made fun of this in the scooby goes Hollywood special. That's where scrappy came in. People make fun of him now but scrappy saved scooby-doo! The kids loved him and the show would go on for 7 more seasons! Note there are two versions of scrappy. The first version is the one everyone makes fun of. The "puppy power" scrappy who scooby would grab and run away from the ghosts. Funny thing is he was super strong and if they had just let him go he would have hurt the fake ghost badly! This version could get annoying and was used in the scooby shaggy scrappy only shorts. The second version they removed puppy power other then in the intro. He got smarter and was the velma of the group but was no longer super strong. This was the better scrappy. When the show got stale again the added real ghosts but also kept fake ones! The twist is you didn't if the ghost would be real or fake that episode! Sometimes it would be both in the same episode! One had them helping a actress who was being haunted by a ghost. The ghost turned out to be fake. The actress turned out to be a vampire! Another had them busting aliens in the jungle. The aliens were fake but both the crooks and scooby gang end up bumping into real aliens and a real ufo! The also helped the universal monsters who was haunted by the ghost of von helson! (monsters getting haunted!) and hire mystery inc to help. The ghost was fake but the magic wand he steals is very real! Neat thing is mystery inc is known for both monster hunting and mystery solving by this time and are hired for both! Some episodes there are no ghost and just crooks or a mystery! 13 ghosts changed it up and did the "find a ghost" each episode thing. The ghosts are all real here. Note the show got more jokey and breaks the 4th wall more this season. They even sing in a episode! Fred and velma were not in this season and flim flam and van ghoul was added. This would be the last scooby show before the superstar 10 tv films and pup named scooby-doo. Last edited by Gaastra; 11-09-2018 at 06:49 AM. 13 ghosts is the third series in the "red shirt shaggy" series of shows. The other two were new scooby and scrappy and new scooby mysteries. Here's the new mysteries intro. This era also had the oddity of Scooby Doo and the Reluctant Werewolf, a movie that featured Shaggy, Scooby, Scrappy, and Gigi Shaggy's girlfriend that we've never seen or heard from in anything else. I'm honestly suprised Mystery Inc didn't at least give her some cameo. Having both supernatural and human threats is a fun way to do a Scooby show. The 13 ghosts might have been good as a season arc. I enjoyed the show when I was younger but Mystery Incorporated was probably the best. If you wanted to do a darker reboot that actually works, thats your show. One season. 13 episodes. They only captured 11 Ghosts. Ι never was a Scooby Doo fan. Especially these live action movies were extremely revolting. Anything with Vincent Price is great. I kind of noticed that, thank you. The ploy says "It all happened one summer while Velma and Freddy where away at camp"; it's the same thing that Fred said during Scooby Doo Mistery Inc. when Dapnhe talked about the 13 Ghosts series. If I remember well, in the original series they captured 11 ghosts and 2 special ghosts; so there's a retcon and they captured 12 ghosts according to the movie. I like Daphne from What's New Scooby Doo?, she was some kind of "fashion Macgyver"
Not only The Reluctant Werewolf, but also the Ghoul School and Scooby Doo meets the Boo Brothers. Kind of wish the Ghoul girls or the Boo brothers had returned in some form in a DTV of TV episode since then. Shaggy turning into a real werewolf is a concept that should definitely make a reappearance. If Mystery Incorporated had continued, I would have like a season that redid The 13 Ghosts of Scooby Doo. Imagine how great that would have been. Well, they're doing a new movie that's supposed to do just that. Whether it actually provides any real closure to the fans or not, who knows? But hey, it gives me a reason to watch the series before the movie drops, so that's something. Ghoul school was really a try out pilot for a ghoul school tv show. They threw in scooby to help sell it. The show never got pick up and never got made. If Warners wants to do an OVA that wraps up 13 Ghosts of Scooby-Doo, fine, but as for the upcoming CGI theatrical Scooby-Doo film, that should be, and probably will be, a stand alone story. 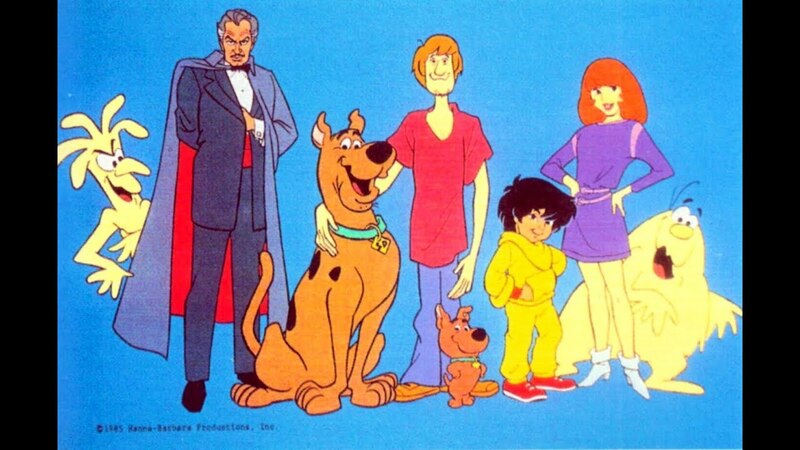 As for discontinuity between series, I don't think we're supposed to think too much about that kind of thing because I don't think the original writers ever did -- especially for reboots/reimaginings like Mystery Incorporated, A Pup Named Scooby-Doo, and Be Cool. I forgot about that. I loved that as a kid? what was the little dragons name again?! I've got to find that on youtube. I haven't seen that in years. Also Scooby Doo and the werewolf. Those were great. The monster race was fantastic. Man I haven't seen those in ages. I do love the theme song to A Pup Named Scooby Doo.